After a busy weekend working and celebrating my friends' birthday, it was lovely to log back into blogger and see I've been nominated for the Liebster Award by Harriet at Simply Lovely which has really made my Monday, thank you! 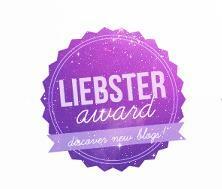 The Liebster award aims to promote new and upcoming bloggers as you can only nominate bloggers with under 200 followers. You need to choose 11 blogs with under 200 followers to pass the award onto and let them know you've nominated them by commenting on their blog. Come up with 11 new questions for them to answer, no tag backs! Q1: Do you speak any other languages? I learnt Spanish at GCSE but I don’t think I’d be able to recall much of it now! Q2: What's your favourite season, and why? Summer because of the weather, more relaxed/less work feel and for the social essence of summer! I generally think that most people seem a lot happier in summer, there’s far more to see and do! Q3: What do you love most about blogging/your blogs? I love how it makes me think about fashion more, integrating it into my daily life. Reading blogs gives me loads more inspiration and blogging works well with my studies! I love how you can document your own style and interact with fellow enthusiasts. Q4: Where do you want to go most in the whole world? I’ve always wanted to go to Hong Kong. As one of the fashion capitals of the world, I would love to go to HK fashion week and experience the Chinese culture first-hand. Q5: Who are your top 5 favourite bands/artists? I have too many favourite artists but the Maccabees, foals, kasabian, bloc party and daft punk are definitely up there! Q6: What's your favourite thing to do on a hot summers day? Spend it with friends either go to a park, have a day out or have a barbeque with obligatory pimms! Definitely no sunbathing would be involved as I just burn! Q7: Do you have any weird talents? I can weirdly pop my right leg in and out of place at my hip. Q8: What do you look for in a best friend? A good sense of humour, loyalty and similar interests. Although I don’t really have these things in mind when making friends, I guess you use your first impressions to gauge whether you like someone or not. Q9: Did anyone inspire you to start your blog? I don’t think so no, I guess seeing bloggers being written about in magazines showed me how prominent the world of blogging is in fashion and thought it necessary for me to blog if I want to gain a career in fashion in the future. Q10: What is your favourite book, and why? The girl with the dragon tattoo, although it’s extremely long and takes a while to get started, the plot unfolds really well and keeps you wanting to read more, surprising you with an unexpected end. I need to watch the film still actually! Q11: If you won the lottery what would you do with the money? I would probably put the majority of it into savings! I would give some to charity and treat family and friends to a holiday but I wouldn’t know what to do with it so I’d definitely save it. Q1-Who would you most like to meet in the fashion world? Q3-What’s your most embarrassing nickname? Q5-Where are the top 3 places you would like to travel to? Q6-Do you believe in ghosts? Q7-What do you want to achieve by the end of this year? Q8-Black and white or colour? Q9-Which is more important to you; career, relationship or money. Q10-What do you want to get out of blogging? Thank you so much for nominating me for the award I will get round to doing this soon! !